Lane splitting is a dangerous motorcycle action taken when a motorcyclist weaves through traffic at a stop light, traffic jam, or anywhere a motorcyclist travels between two vehicles in opposite lanes. Not only is this activity illegal, it is one of the leading causes of injuries and deaths to motorcyclists, as automobiles are not expecting this sort of maneuver to take place. According to the Tennessee Department of Safety and Homeland Security, there were a total of 116 motorcyclist fatalities throughout the state in 2012. When compared to the 777 total traffic fatalities in the same year, it is evident how dangerous motorcycles are across our Tennessee roadways. 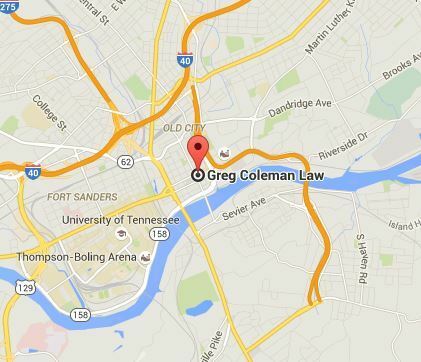 At Greg Coleman Law, our Knoxville motorcycle accident lawyers have great sympathy for injured victims, and their families, as everyone close to the victim often suffers financially and emotionally following an accident. To begin exploring your legal options, call (865) 247-0080, or complete the Free Case Review form located on the right of this page. When an accident occurs to due motorcycle lane splitting, it is at fault of the motorcyclist. This action is illegal, and other vehicles are not anticipating this type of action. Unfortunately, motorcyclists may believe that this action will not cause any harm and continue to do so, thus resulting in an accident. By practicing defensive driving techniques, motorcyclists can avoid accidents and keep our roadways a safer and more enjoyable place for everyone. In the incident where an accident occurs due to lane splitting, there may be several injuries as a result. If these injuries have occurred to the occupants of a passenger vehicle, the motorcyclist will often be held at fault, as lane splitting is not permitted in the state of Tennessee. Remember; motorcyclists have little to no protection between their bodies and the outdoors. Therefore, injuries relating to motorcycle accidents tend to be more severe, and when a motorcyclist takes a negligent action, it could be fatal. Motorcycles may be one of the most enjoyable vehicles across our Tennessee roadways, however riders must also recognize the dangers associated with riding and abide by all traffic laws. At Greg Coleman Law, we believe that when a negligent individual inflicts harm onto an innocent person, that negligent individual must pay for the losses and damages they have caused. For more information about our attorneys, we encourage you to call 865-247-0080, or complete the Free Case Evaluation on this page today.